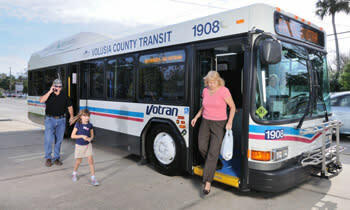 Votran, a service of Volusia County government, provides access to shopping, employment, healthcare and entertainment in the Volusia County area. 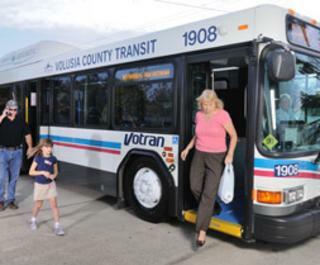 Riders enjoy clean, comfortable and energy efficient public transit by riding Votran. If your trip starts or finishes on a bicycle, Votran buses offer convenient bike racks on the front of the buses; space is limited. Fares come in several mediums, from a one-way trip to unlimited ride passes spanning from one, three, seven or 31 days. Seniors 65 and older, disabled and youth from seven to 18 ride for half-price reduced fares. Ages six and under ride for free when accompanied by a fare-paying guardian. Votran runs full service Monday through Saturday with limited service nights, Sunday and Holidays. Votran does not operate on Thanksgiving Day, Christmas Day or New Years Day. Riders can gain further information about routes and bus schedules, purchase passes and download the Votran app, myStop Mobile, by visiting Votran.org.